Size guide page >>> we hope that you will find all the help and guidance here that you need to help you make the correct purchase and to help eliminate any disappointment from receiving something incorrect for you. You will find product specific sizes in our buying drop down lists at the point of purchase to help you further. If you need any additional help or information before purchasing then please feel free to e-mail us for help and advice. If you do receive something that doesnt fit, then you have the peace of mind of our 14 day  return guarantee which means that you can either exchange or have a full refund on your purchase - please click here for our full terms and conditions. Cricket bats >>> coaches agree with suppliers and manufacturers that choosing the correct size bat is vital for the proper technical development of cricketers. It is important that the bat is not too long and more importantly not too heavy to hinder correct stroke play and development of good technique. The guide below will help point you in the right direction. Batting and wicket keeping pads >>>> the key measurement for pads is not the overall height of the player but is the approximate measurement from the middle of the knee down to the instep ( where the arch of the pad fits). Please note that not all pads are available in every size shown here. Batting/ keeping gloves >>>> the critical measurement is from the start of the wrist to the tip of your longest finger, in a straight line. This again is only approx, but this guide should again be a good help in steering you in the right direction. Helmets >>>> a good fitting helmet is worn with the peak protruding horizontally from the line of the eyebrows. It should fit securely but comfortable with no excessive movement in any direction. We suggest that you always fasten the chin strap for added comfort and security. To measure, run a tape measure around the middle of the forehead, just above the eyebrows, around the side, just above the ears to the bump on the back of the head. 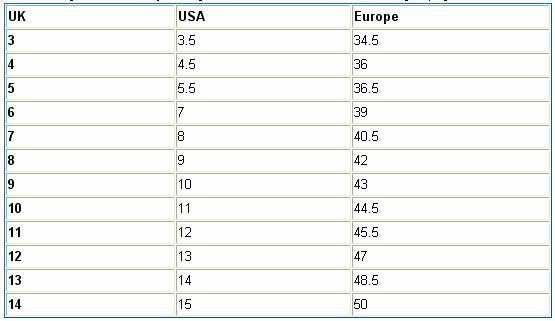 Shoe sizes.>>>> all of our shoes are quoted in UK sizes in the online drop down lists. You should feel comfortable in making your size choice, based on your normal shoe size. - but dont forget to allow for a thicker sock if you wear them. Any shoes which we feel are sized small or large v the industry average are noted on their relevant catalogue page. Clothing >>>> cricket playing clothing tends to be loose fitting for maximum comfort and ease of movement. Whites (trousers) are generally supplied with generous unfinished legs to enable adjustment to the correct fit. On our leisure and International Team / Replica clothing sizes can vary a little more from brand to brand and where possible chest and waist sizes are included in our drop down lists on the respective catalogue product pages. PS for ENGLAND REPLICA CLOTHING please ignore the sizing info in this guide and order by the chest sizes given in the size selection dropdown box on the actual product page.